Earlier this week, we received a call from a friend of ours, Natalie, at Nature’s Nursery Center for Wildlife Rehabilitation and Conservation Education. It was, she informed us, time for a release, something that we’re always up for. So Nat came down with four Virginia opossums, a woodcock and a juvenile blue jay. The release of the opossums went off without a hitch (though one did cling to the top of my shoe and hiss at me for all he was worth before finally scrambling off toward Cranberry Run). The woodcock’s release was equally uneventful, but exciting, even so. We regularly see and, more often, hear them here in the spring. But, to the best of my knowledge, this is the first time we’ve released one at The Quarry Farm. A release, in most cases, is a relatively simple affair: you transport the animal to a suitable location, open the door of whatever is containing the animal, the animal exits its containment and then, ideally, it has the whole of the world to explore, or at least as much of it as it can reach. It is free, beholden to and dependent on no one and nothing. The jay nearly made it. Nearly. He was brought here, the door was opened, he flew out and…he stayed. 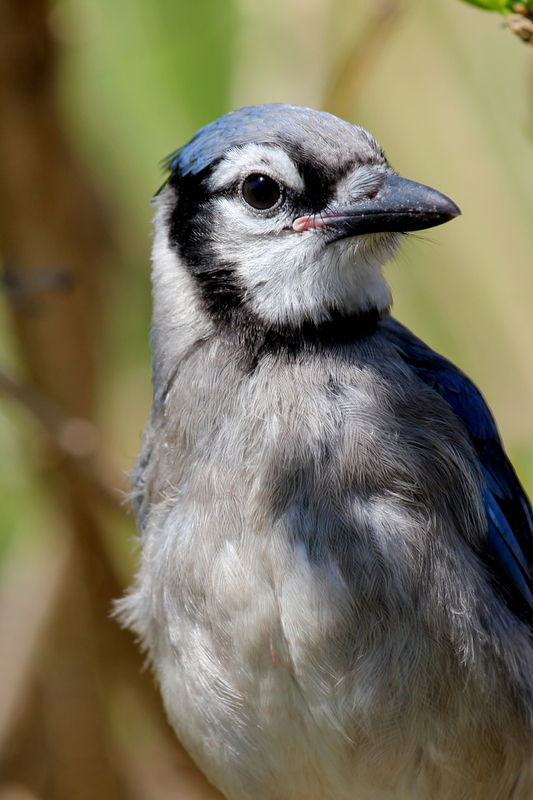 Blue jays are corvids, cousins to crows and ravens, and like their cousins, they’re complex, intelligent birds. They’re also communal, living in extended family groups in the wild. Both of these factors, their intelligence and their sense of community, help them to survive Out There. Both of these factors also make them easy to imprint, particularly when they’re raised alone, as this jay was. With no family to turn to for help, he stays in the only community he’s ever had, with the only company he’s ever known: people. We had the usual concerns when we released him and began the process of moving him toward self-sufficiency, predation being at the top of the list. 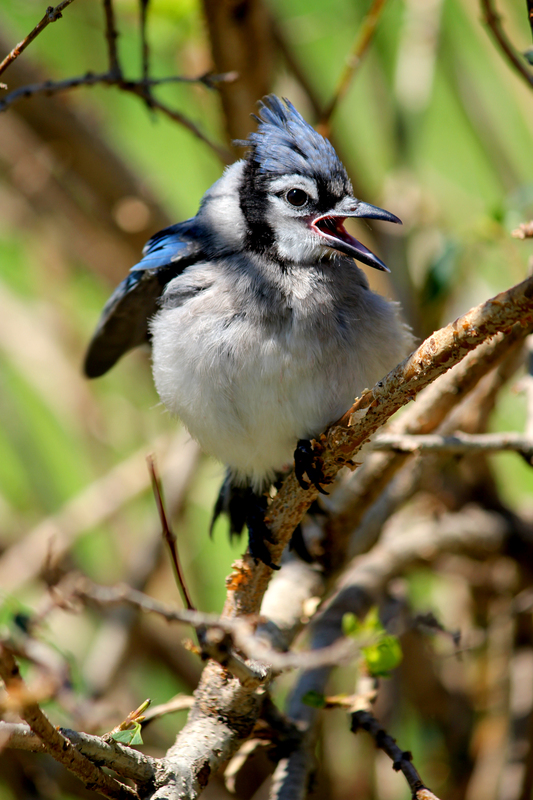 Blue jays are slow fliers and as such, easy pickings. 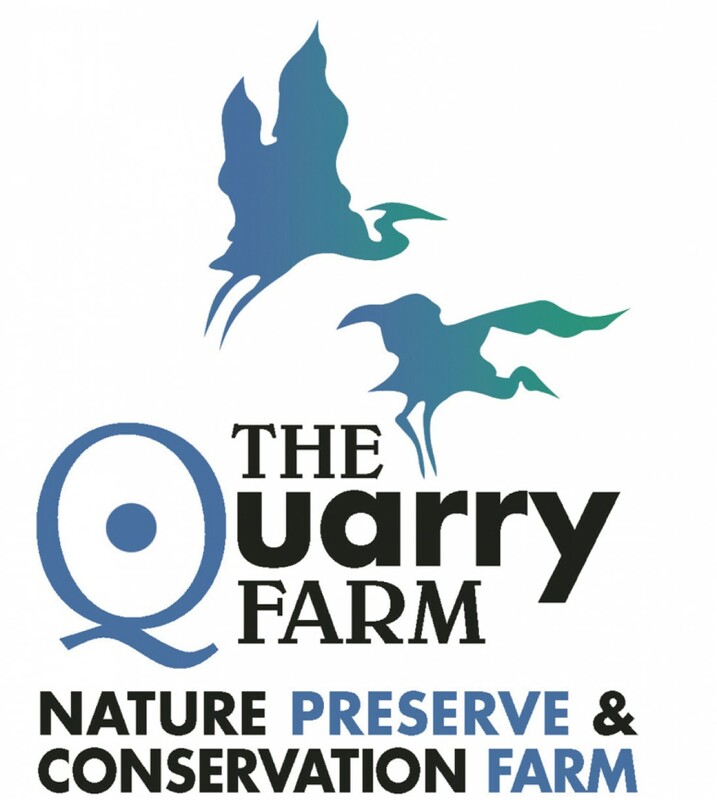 Along with a number of cats that treat The Quarry Farm like their own private larder, there are the wild things that prey on jays: raccoons and Cooper’s hawks and screech owls, primarily, but weasels and even the blue jay’s cousins, the crows, as well. We’re even a little concerned about the chickens; a few of the Jersey giants have developed some unusual feeding habits…but that’s a different story for a different day. 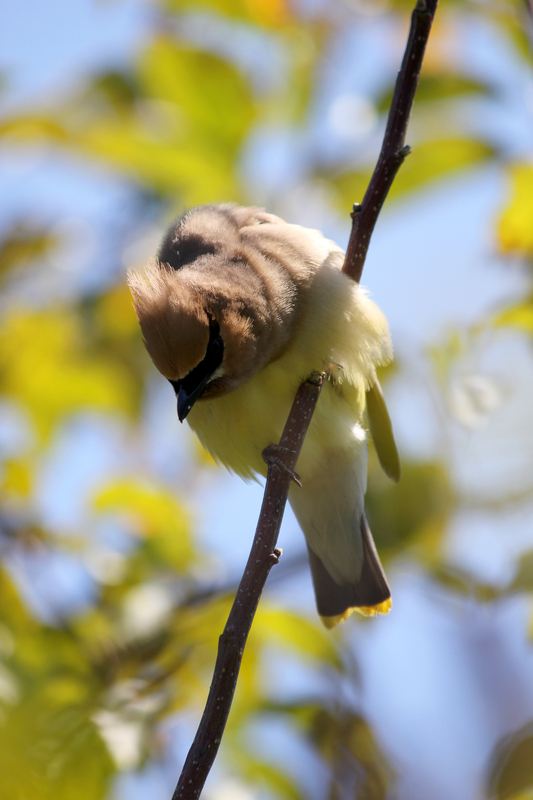 What we didn’t see coming, though, what has proven to be this jay’s greatest challenge, are the cedar waxwings. They found him nearly right away, the waxwings, and they’ve kept an eye on him, and occasionally a beak or talon, ever since. When one spots the jay in the open, it will call the others with short trills, glaring all the while. They harass him in groups of two or three or four. It’s startling to watch. 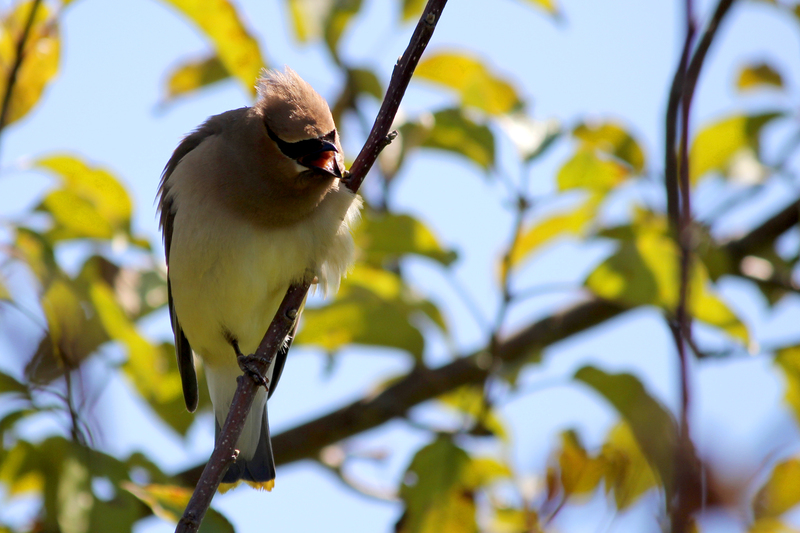 Where jays are slow and somewhat awkward fliers, waxwings are sleek and fast and the coordination that they exhibit as a flock is nearly military in its precision. 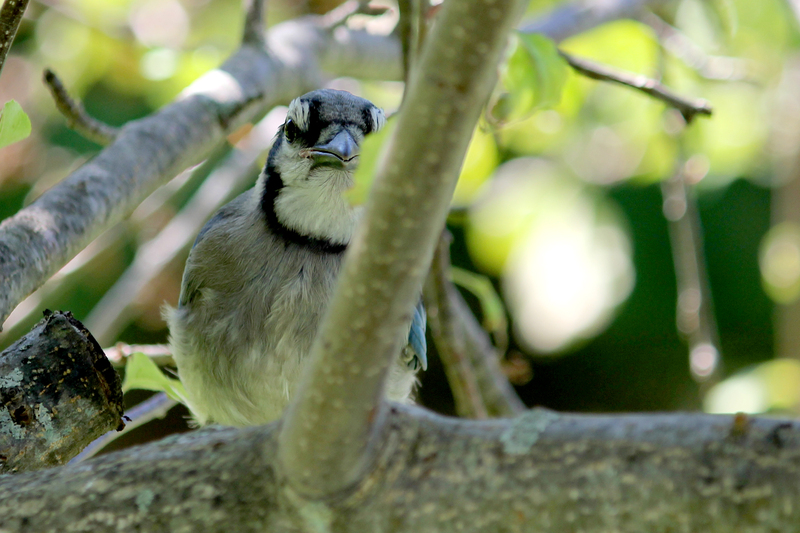 But the jay is smart and takes cover in the dense foliage of apple or coffee trees, hugging the trunk and keeping branches between him and his attackers. Which is not to say that they don’t occasionally get to him, that he doesn’t sometimes need help, protection. Three pinpoint spots of blood on his neck and face tell tales of brief melees that haven’t gone his way. So I watch, now, a little more closely and step in when the odds are too dramatically out of his favor. Either I drive them off, or he comes to me, alighting on my shoulder and hiding in my admittedly thinning hair. This is where the gray area of my participation in this wild thing’s life has the potential to turn black. Because it’s beguiling, this trust he shows in me, this faith. When he sits on my shoulder, when he tucks his head behind my ear, I am, in some small way, connecting with the heroes I read about as a boy. Jean Craig Shepherd’s Sam Gribley and the peregrine falcon, Frightful. Ursula LeGuin’s Ged and his otak companion. Rudyard Kipling’s Mowgli with his family and mentors: Raksha and Bagheera and Baloo. Even so, contrary to what some conventional wisdom suggests, what some rehabbers would insist on, I refuse to drive him away. And not only do I refuse to drive him off, I encourage him to stay. I call him to me and present him with food and, when necessary, I protect him. 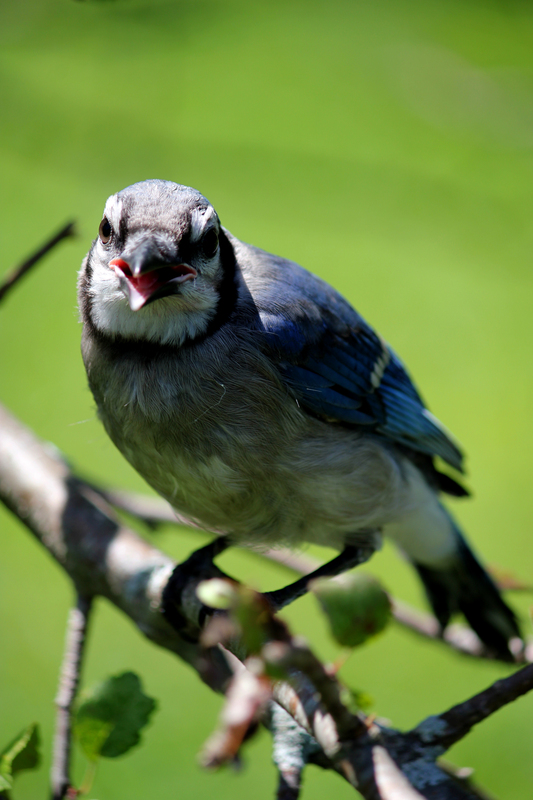 I justify my behavior with the knowledge that, if he’d been raised by other jays, the adult birds would still be a part of his life, defending him from predators and competitors and helping him find food. The fundamental truth is that he’s a young juvenile in a strange place with no other means of support. As rationalizations go, this one is exceedingly rational. Because he needs it, support. Without it, his chances for survival drop alarmingly.